To increase conspicuity of stop signs, a larger size of stop sign than recommended may be used. Use of larger stop signs (Mississippi DOT, from Amparano and Morena 2006). As noted by Atkinson et al. (2014), a high number of crashes relate to the driver’s inability or failure to see the stop sign at stop-controlled intersections. 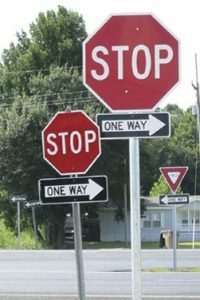 In order to increase conspicuity of stop signs, a larger size of stop sign than recommended may be used. Use of a larger stop sign is covered in the Manual on Uniform Traffic Control Devices (MUTCD) (FHWA 2009) under Section 2B.03 Size of Regulatory Signs. The MUTCD (2009) indicated a crash reduction factor of 19% for all crashes with installation of a larger stop sign. Amparano, Gene, and David A. Morena. Senior Mobility Series: Article 4 Marking the Way to Greater Safety. Public Roads. Volume 70, No. 1. July/August 2006.